There is no reason that the church in Massachusetts should be losing the culture war, and Tuesday night in Lawrence was Exhibit A! 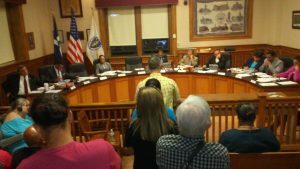 At 11:15 p.m. on July 11th, the overwhelming presence of the local church was the catalyst that caused a unanimous vote from the Lawrence City Council to OPT OUT of commercial pot shops! As you can imagine, the normal attendance for a monthly City Council meeting is quite small, but last night the churches in Lawrence showed up BIG TIME! This is not only an answer to prayer but also the result of MFI’s education and mobilization efforts on the marijuana issue. For months, I have been meeting with pastors and explaining the dangers of the new marijuana law and what they can do to be salt and light in their communities against the threat of pot shops springing up all over. The pastors in Lawrence got the message and lept into action – and it made all the difference. Before the meeting started at 7 p.m., there was a crowd of people from local churches in Lawrence standing outside City Hall with signs advocating to opt out of Recreational Pot Shops in Lawrence. 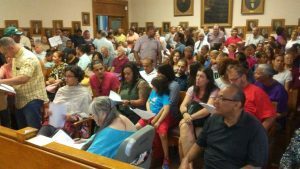 Once the meeting began, it was standing room only with about 100 people inside the City Council Chambers and 100 people in the overflow room just outside. One of the police officers that showed up for crowd control mentioned that it was the largest turn-out he had ever seen at the City Council. Pastors and church members stood in line to give their two minute speeches, and the crowd raised its voice, cheering on fellow Lawrence residents. All throughout the evening, mothers would give first-hand testimony about how their families have been devastated by drugs, pastors representing their church would quote Scripture on why marijuana is bad for Lawrence, and advocates like MFI communicated the alarming problems coming out of states like Colorado concerning pot. The marijuana lobby plainly did not have a chance. They were outnumbered at least 5 to 1. Some of the pot advocates tried to convince the City Council that the people who showed up were all from church and were just following a religious ideology. It didn’t take long for church members to address this ignorant argument and point out the fact that it is the church that is full of professionals and volunteers who care for those in need of help in the city. They are on the front lines picking up the pieces from the devastating effects of drugs in Lawrence. We are hopeful that new state legislation, which we expect to be voted on soon at the State House, will further empower city councils and town selectmen across the state to protect their communities. Lawrence is leading the way for cities in the Bay State to opt out in order to strengthen and protect the family in Massachusetts!